Japan is home to potentially the most cold hardy of all Cymbidium orchids, C. goeringii. This remarkable plant lives further north than any other member of the genus, even up to southern Hokkaido (Okushiri Island, 42 degrees north latitude), where it endures below freezing temperatures from late fall through early spring. An added bonus is the amazing fragrance of its long lasting flowers. Cymbidium goeringii often grows in rocky woods in a very thin layer of humus – almost to the point you could call them lithophytic. Cymbidium goeringii is an evergreen orchid with below ground pseudobulbs and long, grass-like leaves. The pseudobulbs are round and flattened somewhat, growing at tight intervals along the thick rhizome. The roots are many, thick, fleshy and white, and up to a half meter long. The leaves number 4-5 per growth, each being 12-40 cm long and about 1 cm wide. In early fall flower shoots form at the base of that season’s growth. They are thickest at the middle and come to point; 3-4 cm long and about 1 cm wide. This shoot remains in stasis until late March or early April when it begins to grow into a thick flower stalk to a height of 12-25 cm. It is graced with a single flower (very rarely two), and covered by a number of alternating white to green sheaths. The flower is 4-5 cm across. The sepals and petals are bright emerald green with purple striations and sometimes blotching. The dorsal sepal always bends forward over the lip, but the lower sepals either are cupped forward as well, or they flare out laterally, looking like wings. The petals are always cupped forward and very tightly cover the column. The lip is white overall with purple blotches and is also yellow at its point of attachment. It is strongly recurved back to the point of making contact with its base on the underside of the flower. The ovary is purple-pink in color and covered by a large pinkish-white sheath. If pollinated, the seed pod grows vertically rather than staying in the same position as the flower, and grows to a remarkable size. Plants can remain as single growths for years or sometimes become large clumps numbering 15 or more flowering stems. Typical flowers of Cymbidium goeringii are green with a white lip. This species is found throughout Japan from Kyushu to southern Hokkaido (Okushiri Island) as well as Korea and China. Chinese plants can be quite different looking and multi-flowered (e.g., v. longibracteatum). It is found in an array of habitats, from moist woodlands, conifer plantations, to pine forests on seaside sand dunes. The preferred habitat seems to be on extremely steep rocky slopes that are almost vertical. In these places in can grow as a near lithophyte on the thin humus over bedrock. Found from sea-level to ~800 meters on Kyushu. Two remarkable and lovely partially saprophytic orchids adorn the woodlands of Japan, Cephalanthera erecta, and its bigger and more showy cousin, Cephalanthera falcata. They are lovely and yet enigmatic in cultivation, presumably due to a tight relationship they have with soil fungal symbionts. European species of this genus are called helleborine. Cephalanthera erecta is a deciduous woodland perennial plant, standing from 7 to 30 cm tall. The leaves are arrayed around a thin, upright, pubescent stem in an alternating and staggered pattern. Each leaf is bright green and elongated coming to a point, and is anywhere from 5-15 cm long and 1-3 cm wide. They are deeply veined and pubescent and look much like a Cypripedium leaf. In early May the flowers are held at the top of the stem in a loose group, pointing more or less in the same direction. They are 2 cm long and brilliant white, and almost don’t open. Each has a little green spur at the bottom of the lip. Plants occur singly or in loose groups, occasionally forming colonies in the hundreds. 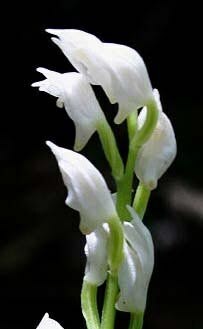 Cephalanthera erecta can be found in dark forests and and growing in grass on sunny roadsides. The common form of this species usually occurs in moist dark woodlands and woodland edges, but sometimes is found on grassy embankments of roadsides and trails. While it is found throughout Honshu, Shikoku, and Kyushu it is absent from Hokkaido. Another variety, sometimes considered a separate species, v. subaphylla, extends into Hokkaido a well. Both are very similar looking. I first saw this unassuming little plant at the edge of a forest in tall grass. It was tiny, standing no more than 7 cm high. A search of the surrounding area for more proved fruitless. A couple years later I found more plants flowering in a deep, dark woodland not more than a five minute bike ride from my front door! The plants I’ve seen are remarkably small and they can be noticed mostly due to their brilliant white flowers looking like little pearls in the dim forest light. The plant itself looks much like a Cypripedium or Epipactis, but the flowers are a dead give away. This species, along with all other members of this genus, are thought to be at least partially dependent on soil fungi for their nutrition, hence they are semi-saprophytic, or more accurately partially ectoparasitic on the fungus. This is surprising due to their bright green leaves. At least one member of this genus is fully ectoparasitic, the North American C. austinae. C. erecta is a small plant and not very desirable as a garden subject, therefore I suspect it will have a secure future in Japan. The flowers of Cephalanthera erecta never truly open. You can see the little green spur at the base of the flower. C. falcata is very similar to C. erecta, standing from 20 to 40 cm tall. The leaves grow in an alternating pattern around a robust, pubescent stem. 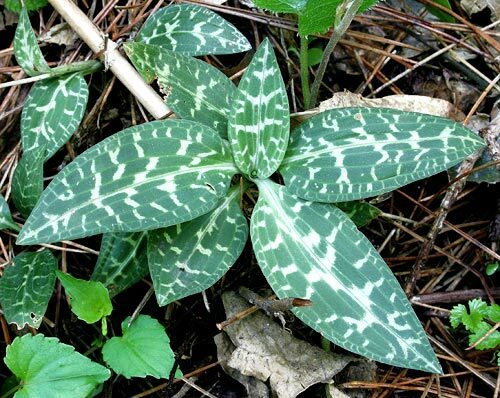 Each leaf is deeply veined and pubescent, looking much like a Cypripedium leaf, being 5-18 cm long and 2-5 cm wide. They overlap each other such that the bulk of the stem isn’t visible. In fact the plant itself looks nearly identical to Cypripedium californicum. The flowers are held at the top of the stem in a fairly tight group and facing upward. They are large, showy, and bright yellow and are 2-3cm across. Unlike C. erecta the flowers open more fully, but remain cupped. Cremastra appendiculata is a curious terrestrial orchid from the warmer woodlands of Japan, Korea, and China. It’s single leaf is green in winter and dormant in summer, thus revealing its membership in the Calypso tribe. It was one of the first orchids I encountered in Japan, and in time I found out that it is rather common and widespread. In fall a single leaf comes up from a string of bulbs spanning an underground rhizome like oversized beads. The leaf is dark green and smooth, 20-35 cm long and 5-8 cm wide, and slightly glossy. It persists through the winter months until the plant is finished blooming sometime in early June at which point it dies down. Come spring the leaf is often covered in yellow blotches. I’m not sure the source of these, but most plants have them. 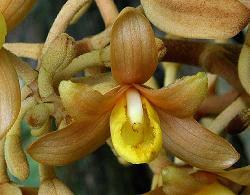 This trait is also seen in another Japanese orchid, Phaius flavus. The branch less flower raceme starts growth in early May and by late May the flowers are fully open. There are between 10-30 of them. A flowering plant of Cremastra appendiculata, You can see the yellow spotting on the leaves – not a virus, but a peculiarity of its leaves. The flowers are elongate, approximately 4 cm long, only partially opened, and downward hanging. The sepals and petals are a greenish brown color and are suffused with purple. The lip is three lobed. It is almost a tube and elongate. The base of it along with the lateral lobes are bright purple/pink. The central lobe is pure white with some purple/pink markings. The column too is elongate; purple/pink at the base, white at the tip, and the pollina are bright yellow. “Alba” forms exist, that is, green flowered plants without any purple pigmentation. After flowering the leaf turns brown. If the flowers are pollinated, seed pods will form and mature by late summer, and split around November. 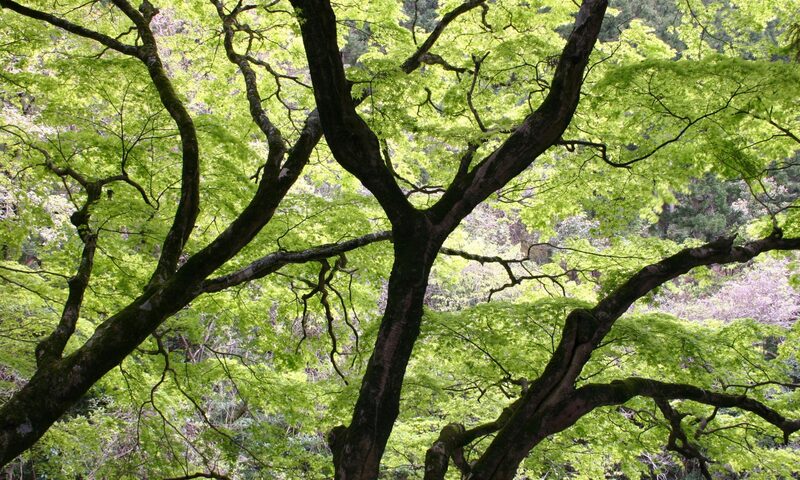 On Kyushu it is frequent in moist to wet woodlands in moderate to deep shade, often along streams, seeps, and sometimes even on the edges of small mountain rivers where it is subject to periodic flooding. It ranges throughout much of Japan from Kyushu to southern Hokkaido (Sapporo), and also Korea and China. These plants of Cremastra appendiculata were the first ones I found in Japan. Here they are growing spitting distance from a brook – a typical habitat for this species. This species, like many of its relatives in the tribe Calypsoeae, is green in the winter months and dormant in the summer. It is much like the North American orchid Aplectrum hyemale in many respects, and I like to think of it as the Asian counterpart. I first found this curious and lovely plant in fall just after the new leaves had appeared. I knew it was an orchid, but I wasn’t at all sure which. They were growing on a mountain along a small stream deep in a mossy woods. I followed the plants through the winter and figured it to be an evergreen species, perhaps related to Phaius. Come spring I finally got to see its flowers one warm day in May, and it was then that I found out its true identity. Japan’s warm temperate forests are home to a truly unique saprophytic orchid species, Cyrtosia septentrionalis. The genus Cyrtosia is mostly from southern Asia, so this species is a northern outlier. In fact the name septentrionalis means “of the north”. It is lovely in flower and fruit and unique in many ways. C. septentrionalis grows a leafless highly branched flower stalk to the height of 35-55 cm starting in late May, and by late June strange clusters of yellow and orange-brown flowers hang every which way off short lateral stems. Each flower is about 3 cm across. The lip is golden yellow and curled upward nearly clasping the column and thus forming a tube-like structure. Its upper surface is covered in fine bristles. The white column is long and descending, cradled by the curved lip. The sepals and petals are a uniform orange-brown color, sweeping backward in elegant lines from the flower’s front. The buds, ovaries, and backs of the sepals and petals are covered in a light pubescence. Flowering plants of Cyrtosia septentrionalis are large and showy, and yet are difficult to spot in the wild. After pollination, sometime in July, huge banana-like cherry red seed pods begin to form in hanging clusters and are fully mature by early fall. Each pod is 6-10 cm in length and covered in fine bumps. Inside winged seeds are formed and from what I can tell, the pods never truly split, hence the seeds within simply drop to the ground still within the pod. Presumably they germinate once the pod rots way. Being a saprophytic plant (or more exactly, an ectoparasite) it bears no leaves and has no noticeable green color. 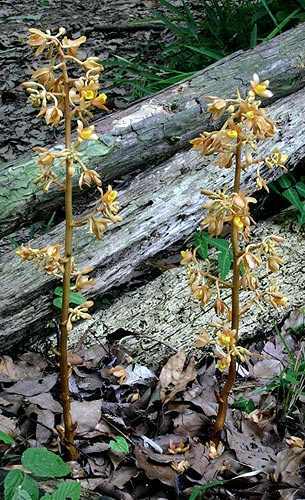 This unique terrestrial orchid is found in moist woodlands in moderate to deep shade throughout Japan from Kyushu to southern Hokkaido (Sapporo). It is said to also be in Korea. The plant seems to prefer the rich evergreen broad leaf forests at lower elevations, ~300-500 m.
Cyrtosia septentrionalis has lovely flowers and they are fairly large, about 3 cm across. 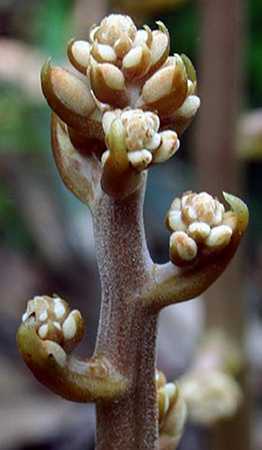 The young buds of Cyrtosia septentrionalis show the relation of this genus to Vanilla orchids. 1. It is closely related to Vanilla orchids having huge bright red seed pods, hanging like crimson bunches of bananas. Clusters of flower buds also show the affiliation with the genus Vanilla. 2. The seeds within are very large winged affairs. Members of this genus have the largest seeds of all orchids (see pic with my grubby finger). The wing also is a unique feature. 3. It is an ectoparasite with no visible green parts (achlorophyllous). They live in close relationship with specific fungi and are in turn either using dead organic matter in the soil as a nutrient source or the roots of other plants. 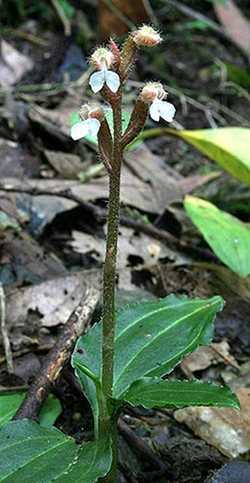 Japan’s dark, wet southern woodlands are host to an odd saprophytic orchid, Epipogium roseum. 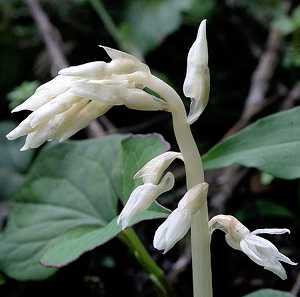 Despite its name this plant appears pure white when encountered, so I call it the “ghost orchid” of Japan. In truth this achlorophyllous herb (lacking chlorophyll) is a far ranging species, found throughout much of the southern hemisphere except South America. The mature spike of Epipogium roseum is perfectly straight. Epipogium roseum sends up a leafless, crystalline white flower stalk that arises to the height of 15-40 cm by early summer. The flower buds form in a slightly hanging cluster at the apex of the stalk (not unlike Calanthe reflexa) initially, but as it elongates the flowers are presented alternately along the perfectly straight scape. These are pure white, cupped, downward hanging, and about 1 cm long. The sepals and petals are elongate and look similar to each other. The lip is broader and a little frilled, but remains mostly cupped and inconspicuous. Close inspection shows the it has a few purple speckles on it, yet hardly worthy of the name roseum. The flower stem and the flower’s ovaries have a slight yellow brown color, but the overall impression is of a totally white plant. Pods form rapidly after the flowers have opened perhaps hinting at self pollination (autogamy). Being a saprophytic plant (or more exactly, an ectoparasite) it bears no leaves and has no noticeable green color. It is found in moist woodlands in moderate to deep shade. Some sources state that it is commonly seen growing in compost heaps and that is exactly where I first found the plant. In Japan it occurs as far north as the central Honshu coast to Chiba and Kanagawa Prefectures (Miura Peninsula), and southward to Shikoku, Kyushu, Okinawa and its surrounding islands. It is definitely a more tropical species, being found from Taiwan to southeast Asia including Malaysia, Melanesia, southern China, Vietnam, Thailand, and India. Surprisingly it is also reported from Australia, New Zealand, and almost beyond expectation, in east Africa (Kenya). Likely it is found throughout East Indies as well. I first found this species most unexpectedly growing on the verge of someone’s garden. Nearby several plants were growing out of a compost pile, and in the surrounding woodland were many more plants. The most notable aspect of this plant is that it has no obvious color in spite of its epithet, roseum. The lower stem can have a bit of yellow brown, but that is hardly noticeable at first glance. The clear white stems, buds, and flowers also belie a translucence on close inspection. The buds of Epipogium roseum start out hanging nearly downward in a tight cluster. Japan is this species’ northern outpost, up to central Honshu, but otherwise appears to be mostly a denizen of subtropical and tropical forests throughout southern Asia. The plant grows from a subterranean tuber-like root. The flowers only superficially open, remaining strongly cupped and generally face downward. Though not a real beauty, is is an interesting species. It is said to be rather rare throughout its range, or at least is under reported. 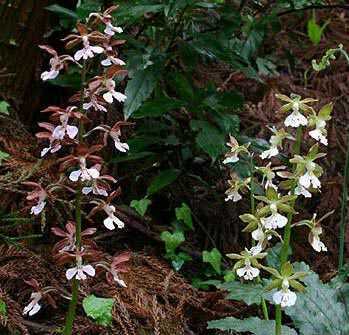 In the warm temperate woods of southern and central Japan exist two beautiful terrestrial orchids, Calanthe discolor and C. sieboldii, as well as their natural hybrid, C. x bicolor. C. discolor still exists in some quantity in the wild, but C. sieboldii as well as their hybrid have been collected almost to the point of extinction. Even to this day plants routinely “disappear” from their mountain homes, often ending up for sale at roadside vendors and orchid shows. Let’s have a look at the most common of the three first, C. discolor. C. discolor is a conspicuous and showy orchid species. The leaves are evergreen and deeply ribbed giving them a pleated look. Each is 10-30 cm long and 5-10 cm wide. Most growths have only two leaves, but as many as four are possible. The relatively small subterranean pseudobulbs are round and have ribs, growing in a chain, so people thought they looked like shrimp, hence the Japanese name ebine, meaning literally “shrimp root”. These two Calanthe discolor growing side by side show the two ends of the flower color scale for this species..
From the center of each growth a branch less flower stalk arises to the height of 15-35 cm and can sport anywhere from 5 to 20 bicolored flowers. Each flower is about 3 cm across and has a rounded look with the sepals and petals being the same color and similar in shape and size. The lip is three lobed and a different color. The lateral lobes are broad, with rounded edges and are smooth. The central lobe is lightly to deeply ribbed with varying numbers of protrusions. It is often lobed at its end as well. The column is large and knob-like and is usually the same color as the lip. Flower color can vary widely with the typical flower having a white lip with pale purple markings (sometimes yellow as well) and the sepals and petals being a shade of greenish-brown. Having said that I’ve seen flowers ranging from the typical type to ones with pure white lips with green sepals and petals, others with purplish lips with chocolate brown sepals and petals, and ones completely suffused with purple. 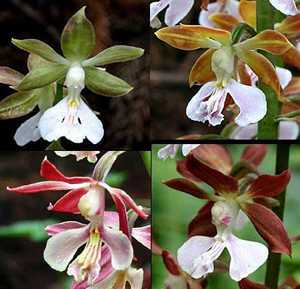 The flowers of Calanthe discolor are highly variable in color and form. This species grows in a variety of habitats including wet to moist woodlands, conifer plantations, along mountain streams, on tops of mountain ridges, and on seepage slopes. It can be found throughout the warmer temperate regions of Japan from Kyushu to southern Hokkaido. Plants can be single growths or make large clumps in time with 20 or more flowering stems. 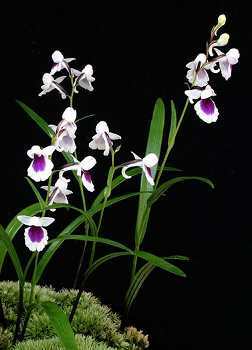 Japan is home to many miniature species of orchid, but few come close to Ponerorchis graminifolia it terms of showiness. It is so lovely in fact that plants in the wild are all but gone these days from over collection. Luckily, it has proven to be fairly easy to grow and so today there are many varieties to choose from. 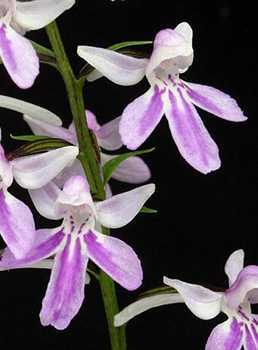 Ponerorchis graminifolia is a dwarf herbaceous perennial orchid of craggy rock ledges. The entire plant rarely exceeds 15 cm in height. The grass-like narrow leaves number between 3-6 per growth and occur alternately opposite each other on a thin, yet strong stem. The glaucous leaves are longest at the bottom and tapper off to very short, almost bract-like affairs at uppermost (near the flowers). They can be bright green, deep green, or striated with purple streaks depending on the variety and are between 2-10 cm long each. Another fancy selected form of Ponerorchis graminifolia. The leaves are grass-like, hence the name graminifolia which means, “grass leaf”. The flower stalk continues on from the last leaf for a considerable distance (up to half the entire height of the plant) and bear anywhere from 1 to 20 flowers. The flowers are small, no more than 2 cm on average. Each flower has an attending bract, but are so small so as to be almost unnoticeable. Naturally occurring plants have flowers with a deeply trilobed lip, back flung, narrow sepals, and a hood-like structure composed of the dorsal sepal and petals covering the column. The flower also boasts a conspicuous spur that is usually fairly straight in the wild forms, but tends of be hooked in many of the cultivated varieties. Typical flower color is pinkish with purple striations on the lip in particular. Variation in cultivated forms is extreme as you can see in the photos. This flower is a wild type form of Ponerorchis graminifolia. The lip is much reduced in size and the flower is a bit smaller than selectively bred ones. The roots are few, fleshy, and relatively short. They last only one growing season. The plants grow from underground light brown tubers that look like little potatoes. Their shape is anything from round to elongate to forked (hence the name orchis meaning “testicle”) and range from 1-8 cm long. These can increase from year to year considerably with a vigorous plant producing 3 or more new tubers from one parent tuber. Again, these last just one growing season feeding the new growth and flowers. So, the underground portion of the plant is completely renewed each season, as are the above ground parts – a fact that is truly amazing when you think about it. Two miniature jewel orchids grace the high ridge lines of the mountains around Fukuoka Prefecture in Kyushu, southern Japan. They are easily missed if you’re in a hurry since neither is usually much larger than a large coin. 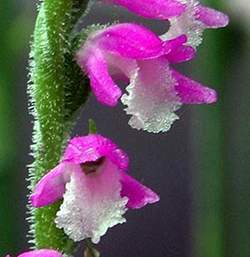 Both are in the genera Goodyera, a circumboreal genus related to Spiranthes. Goodyera schlechtendaliana is a dwarf evergreen terrestrial orchid with small rosettes of leaves growing off a partially subterranean and trailing rhizome. These rosettes can be up to 10 cm across in large specimens, but usually are no more than 4-6 cm large. The deep green leaves are patterned with white veins in varying amounts with some intricately ornate while others are almost pure green, and are from 2-5 cm long and 1-3 cm wide. A lovely specimen of Goodyera schlechtendaliana. The branched less flower stalk starts growing in July. It is strongly pubescent, light green, and rises to a maximum height of 15 cm. The flowers are born in a loose spiral, and yet all face the same direction. They are few in number, anywhere from 3-15, and open sequentially. Although a tiny plant, the flowers are relatively large with some nearly being 2 cm across. They are white with a light pink cast, and the outer surfaces are strongly pubescent. The peak flowering season is August, but trails into September. Goodyera schlechtendaliana, flowering plants in habitat. The lip, dorsal sepal, and petals form a tight protruding formation with the dorsal sepal and petals making a little hood over the lip whose tip points downward (looking like a little tongue). The lower sepals flare out laterally with a graceful curve and look like wings. The overall impression is of a small white bird in flight. In fact, the Japanese name means “deep mountain quail”, perhaps a reference to the flowers and also the veined leaves which might be thought of as quail wings. Seed formation is rapid, perhaps no more than one month total. After flowering the growth dies and a new set of leaf rosettes form along the rhizome. This plant is found in moist woodlands, conifer plantations, and ridge-line forests, from sea-level to ~1000 meters throughout central and southern Japan. It is also reported from Korea and China. Goodyera schlechtendaliana has large flowers compared to the plant itself – don’t even ask about the name! This is a small plant with a big name. It is cosmopolitan about its habitat choice, being found at near sea-level to the highest mountain ridge-lines, at least in Kyushu. It is seen most frequently on the very tops of these ridges in relatively dry woods with the caveat that these places can receive 2 meters or more of rain annually. Here it can form extensive, dense colonies, but is most commonly seen sprinkled throughout the woods in loose groups. 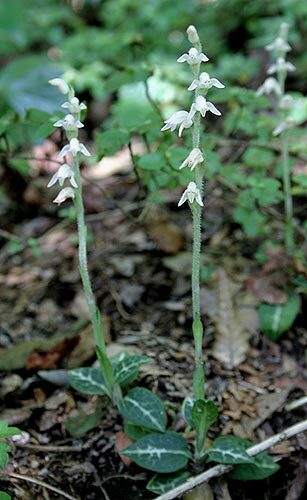 Japan has one truly weedy orchid species, Spiranthes sinensis. This is a remarkable plant for many reasons, not the least of which is its startling purple-pink color. It is one of the few orchid species that has actually benefited from human activity, in particular the clearing of forests and creation of grassy areas where it thrives. Let’s take a closer look at this fascinating plant. Spiranthes sinensis is commonly seen on roadsides, fields, and lawns. These are growing in a park in Sasaguri Town, Fukuoka Prefecture, Kyushu. Spiranthes sinensis is a short-lived perennial plant, growing singly or in small clumps, and capable of forming colonies of thousands of individuals. In mid fall a small rosette of bright green leaves form around a central growing point. They are held close to the ground and are 3-6 cm long and 1-1.5 cm wide. In the cold winter months they stop growing but remain green. Starting in late March they begin to grow again and by May or June have elongated up to 12 cm and increased in number. Sometime in late June the branch less flower spike begins to grow from the central growing point and by mid July is standing 15-40 cm tall and sporting anywhere from a handful of flowers to several dozen. The flowers are arranged in a helix around the spike, and flower sequentially. The flowers are small, no more than 6 mm across. The sepals and petals are long and point forward with the dorsal sepal and two petals forming a little hood over the lip. They range from pale pink to deep lavender in color. The lip is relatively broad and tongue-like in shape and recurves downward. It is frilled and pure white. The overall look of the tiny flowers is crystalline. 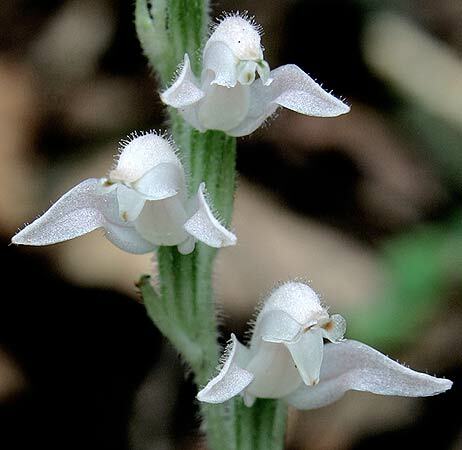 Albino forms exist, but why would you want to have just another white Spiranthes? Volunteer seedlings show up all over the garden. In this case a seedling is growing in an epiphytic cactus pot. Seed formation is rapid, probably taking just a few weeks. By the time of flowering the leaves are all but spent, and after flowering they disappear completely only to regrow a few months later. These lovely plants range over all of Japan, the Korean Peninsula, part of Russia, and also China. They favor open, sunny, grassy areas such as roadsides, fields, the berms of rice patties, and lawns, but also grow in bright shade just within the eves of a forest. It is a common volunteer plant in garden beds and flower pots as long as these are sunny and moist. One thing I like about Japanese orchids is that they aren’t gaudy or overstated, but rather tend to be small, simple, and elegant. This plant is a good example. If you are zooming down a highway you will miss this plant in flower even though thousands many be growing on the very edge of the road. To truly enjoy it you have to get down on your hands and knees (I prefer my belly) and take a close look. You’ll be amazed with what you see: spirals of pristine purple-pink and pure white crystalline flowers bathed in bed of grass. Up close the flowers of Spiranthes sinensis are truly spectacular. Anyone familiar with the North American members of this genus will be surprised with the flower’s color since virtually all other species are either pure white or yellowish. I’m constantly on the lookout for this little plant when I’m near a grassy park or field. 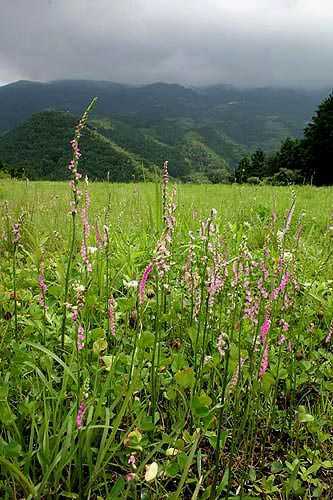 In Japan grass is not usually cut at regular intervals as in America, but is left to grow for a month or more giving the Spiranthes plants time to grow, flower, and even set seed. They set seed remarkably fast – possibly as fast as just a few weeks. 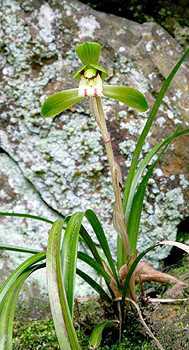 Kyushu, Japan’s southernmost main island is home to an extremely rare orchid species, Odontochilus hatusimanus. This plant is so rare in fact that it was listed as extinct for several decades before being rediscovered in the late 1990s. It just so happens that I live right next to a mountain that has one of the remaining populations left in nature. O. hatusimanus is a low growing evergreen terrestrial orchid. The ovate leaves originate out of a central growing point and form a small, neat rosette. They are glossy, dark green, lightly veined, and about 5-6 cm long and 3-4 cm wide. The rosettes grow from a trailing rhizome that is at or near the surface of the ground. From the center of the growing point a single hairy branch less flower spike grows to a height of 6-10 cm and sports up to 8 small flowers about 1 cm across each. The pure white lip is cleft in the center forming two lobes that are slightly serrated. The remaining sepals and petals are covered in long white hairs and are pinkish green in color. These don’t fully open and thus form a hood-like structure. A large clump of Odontochilus hatusimanus in habitat, Fukuoka Prefecture, Kyushu. It is a denizen of wet broad leaf evergreen woodlands of Kyushu Island, Japan, preferring the wettest sites possible, growing nearly in small streams and areas that commonly flood. 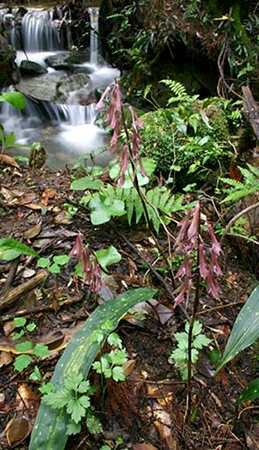 In these areas Calanthe reflexa, another terrestrial orchid, grows sympatrically. This rare delight was first described by science in 1957 and was thought to be extinct, however, just a few decades later it was rediscovered. Currently it is only found at two sites on Kyushu, in Kagoshima and Fukuoka Prefectures. The first rediscovery was in Kagoshima in 1999, and shortly thereafter in Fukuoka. It remains critically endangered. Through shear dumb luck and an observant eye, I stumbled upon a nonflowering plant back in May 2004 on one of the local mountains. Unfamiliar with the local flora at the time, I wasn’t sure of its identity, but I guessed it to either be related to the genus Goodyera or to be a Goodyera itself. 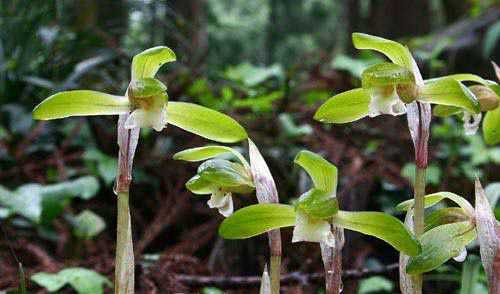 A search on the internet and consultation with a native orchid expert IDed it as Goodyera foliosa. I tried to find it in flower later that season, but the only plant I knew of grew no spike that year. The plant flowers in late July in its native home. In 2005 I returned in late August and found a small scattered colony already in seed. That was a bit confusing since G. foliosa was supposed to bloom in August and September along with its cousins G. schlectendaliana and G. velutina, two species found in the general area. The following year I was determined to photograph the flowers and made repeated trips to the colony starting in mid July. I was finally rewarded in late July, finding two plants in perfect flower. I sent the shots off to an orchid friend and he replied that it was not the Goodyera after all, but rather the extremely rare Odontochilus hatusimanus, a species I had never heard of. What a thrill to have found such a rare species in my own backyard!